The ePedagogical Framework is an ICT pedagogical model, to support teachers in using ICT in education on the basis of pedagogical reflections. The ePedagogical Framework is based on the idea of, that the starting point of teaching must be the teacher's reflections on the purpose of education, followed by reflections on the objectives and content of teaching, and that the teacher, on the basis of these pedagogical reflections, must select a certain form of teaching. The three forms of teaching that are presented in The ePedagogical Framework are linked to an understanding of teaching as guiding someone, into something, through communication (Oettingen 2012), and the idea of the framework is, that the communication of the classroom can be either monological, dialogic or polyphonic. The framework is inspired by M.M. Bakhtin's philosophy of language in this matter. The three forms of teaching are first described in my master thesis (Pasgaard 2009). 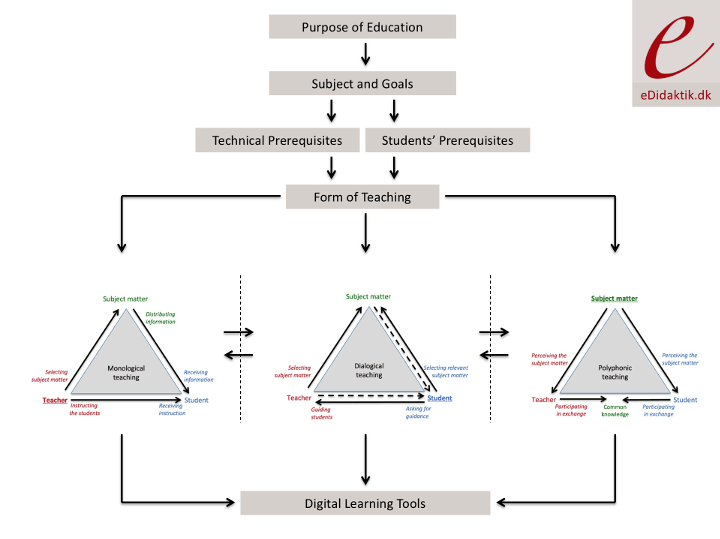 It is important to point out, that the three forms of teaching will often overlap each other and that they will rarely show up in their pure forms, but the idea is, to the various forms of teaching calls for the use of various types of digital learning resources. In the following the monological, the dialogical and the polyphonic forms of teaching are presented, with examples of what types of learning tools, that may best support them. In the monological form of teaching the goal is, for the learner to acquire the knowledge and skills which the teacher believes are relevant. Teaching is, in the monological form, a matter of the teacher, as a representative of society and the existing knowledge, shares this knowledge with the student, and learning thus consists in the learner's acquisition of this knowledge. Communication within this form of teaching thus becomes monologic, and is completely controlled by the teacher's dominant voice. Prior to the classroom teaching the teacher defines clear learning objectives, and chooses the subject matter, which is to be worked with and studied in class. The subject matter is selected in a way, so that it distributes the quantity of information to the student, which the teacher believes is relevant to him in relation to the given topic. Along with the teacher's instruction of the student, the subject matter's distribution of information is to ensure, that the student learns excactly, what the teacher has planned, for him to learn. After teaching the teacher will be able to compare the student 's learning outcomes with the learning objectives, that she had defined before the teaching begun. In particular, distributing and supplying digital learning resources are relevant within the monological form of teaching, in which the transfer of information from teacher to student is a key element. In relation to the evaluation of students' learning outcomes, tools for giving standardized tests are also relevant in this form of teaching. In the dialogical form of teaching the goal is, for the student's innate knowledge to be developed in dialogue with the teacher's voice and knowledge, in order to make the student able to solve authentic problems. In the dialogical form of teaching, the student will have the opportunity to hold his own knowledge and his own views up towards the subject's (the teacher's) knowledge and attitudes, and the teacher acts as a supervisor and guide in this process. Communication within this form of teaching thus becomes dialogical , and is controlled primarily by the student's own voice. The teacher chooses a subject matter, which could make it possible for the student to experience what is relevant within the field, and to define and solve authentical tasks. In the learning situation, the student chooses to work with the parts of the subject matter, that he finds relevant, and he uses this part of the subject matter as a basis for solving the given tasks. If there is not enough help to get from the subject matter in relation to solving the tasks, he contacts the teacher, who will then act as a guide. The student's learning outcome from a dialogical form of teaching can be tested through open, written assignments and simulations, where the student can show, that he can use his gained experience and knowledge in different contexts. Especially digital learning resources that support students' problemoriented work are relevant within the dialogical form of teaching, where the student's own experience is the key element. Also simulations and advanced learning games can be relevant in this form of teaching. In the polyphonic form of teaching the goal is, that the students and the teacher gain mutual understanding and knowledge through equal dialogue. The polyphonic form of teaching is based on the idea, that knowledge is created through an equal exchange of many different individuals ' experiences of the subject matter, and learning occurs from the pupil's participation in this exchange. Communication in the educational space thus becomes polyphonic, and is controlled by both teacher and students. The teacher and students collaboratively select the subject matter, which is to be worked with and studied in class. They are equal in this process, and they share equal responsibility for producing new knowledge within the given field.. The student's learning outcome cannot easily be measured or tested within this form of teaching as is the case in the monological form of teaching, but others may subsequently test the knowledge, that is created in the community of practice, as this knowledge will contribute to the accumulated knowledge within the entire field. Especially digital learning resources that support cooperation and joint knowledge production is relevant within the polyphonic form of teaching, where equal collaboration is a key element. The three forms of teaching, that are presented in The ePedagogical Framework, call on the use of various types of digital learning resources. Under the menu item Digital Learning Tools You can read a number of articles on various digital learning tools, which may support the three forms of teaching. The articles describes the tools in accordance with the teaching forms of the ePedagogical Framework, and the articles provide inspiration on how the tools can be used within the different forms of teaching.